This was the fifth survey (after March 2014, July and November 2016 as well as April 2017) of sites in Rason Special City, DPRK. 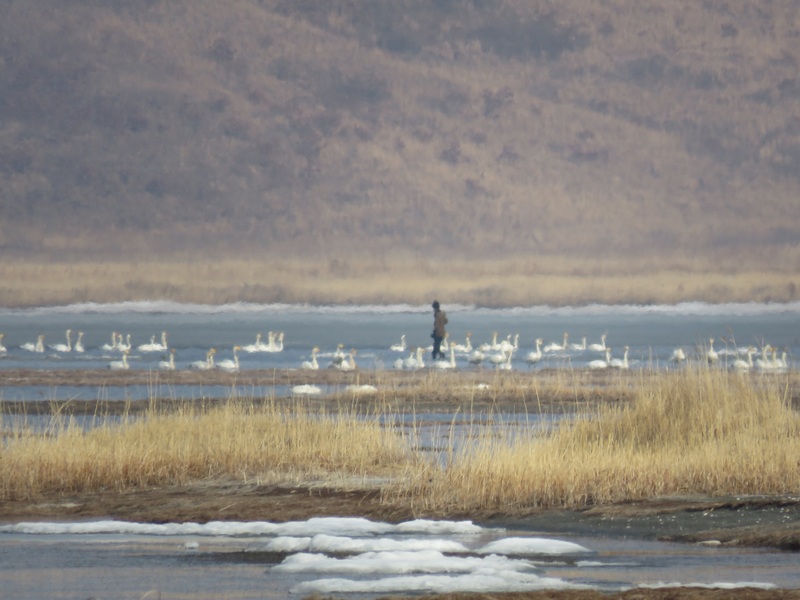 The survey was the first survey after Rason was nominated as a Ramsar site, together with Mundok, when DPRK declared its participation in the Ramsar Convention on Wetlands end of last year. 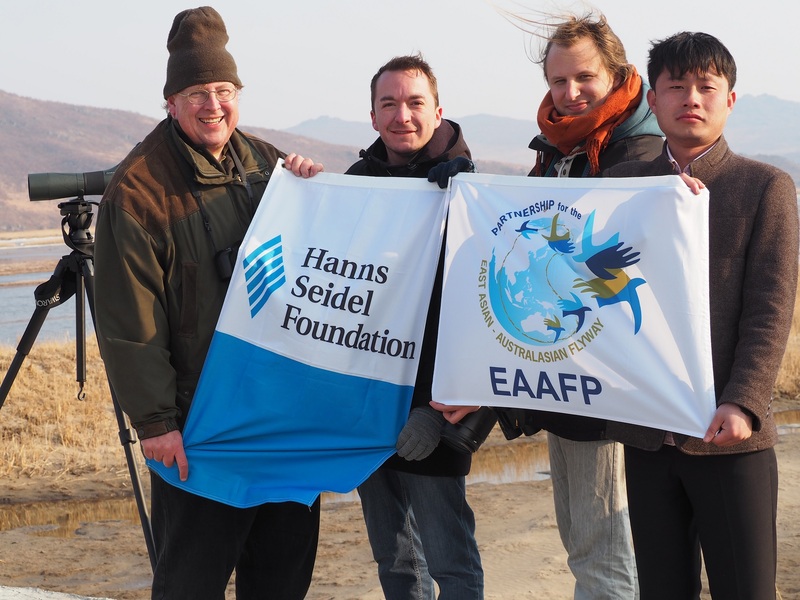 Together with a very helpful team from Rason city we could once again establish the importance of Rason on the East Asian-Australasian Flyway. Due to the long cold spell the largest of the lagoons, lake Manpo, was still completely frozen at the beginning of the survey and only started to unfreeze at the end of the survey. All the same, overall more than 20.000 birds were estimated to be in the lake area and adjacent rice paddies and wetlands, with large fluctuations every day showing the dynamism of the area. 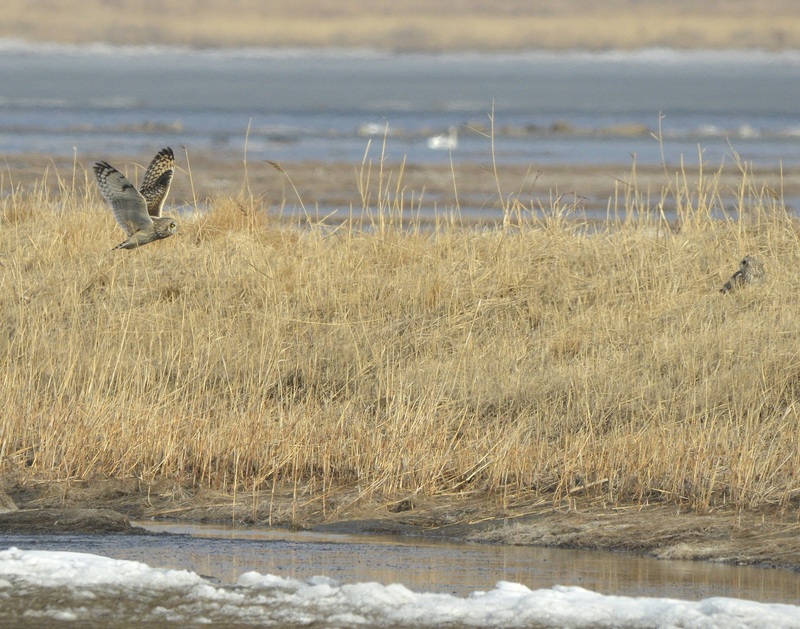 The dynamic nature of migration into and through the area was visible for example in the number of Eurasian Coots; while on March 24, we counted less than 100, on March 27, in the same area more than 3,000 were present. Among the ducks, Eurasian Wigeons, Mallards, Spot-billed Ducks, and Eurasian Teals and Falcated Ducks were most numerous with at least 2,000 individuals each and probably for the first three species much more, in the adjacent fields. Also, at least one American Wigeon was among the birds. By March 27, most Falcated Ducks had disappeared. There were still very few grebes, very few migrating passerines and not a single buzzard, probably due to the cold. Disturbance through humans walking through the fields and wetlands (gleaning in rice paddies, fishing and looking for shells in wetlands, and preparing fields for the summer) was again, like in previous surveys quite high, making it also improbable for more sensitive birds like cranes to roost in the area. 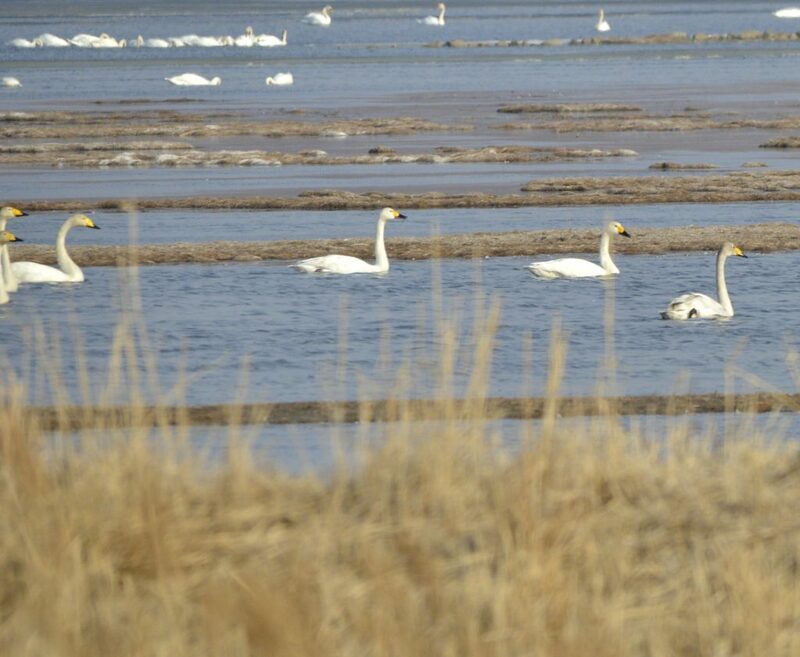 This might become an important issue for the future management of the Rason Ramsar site. 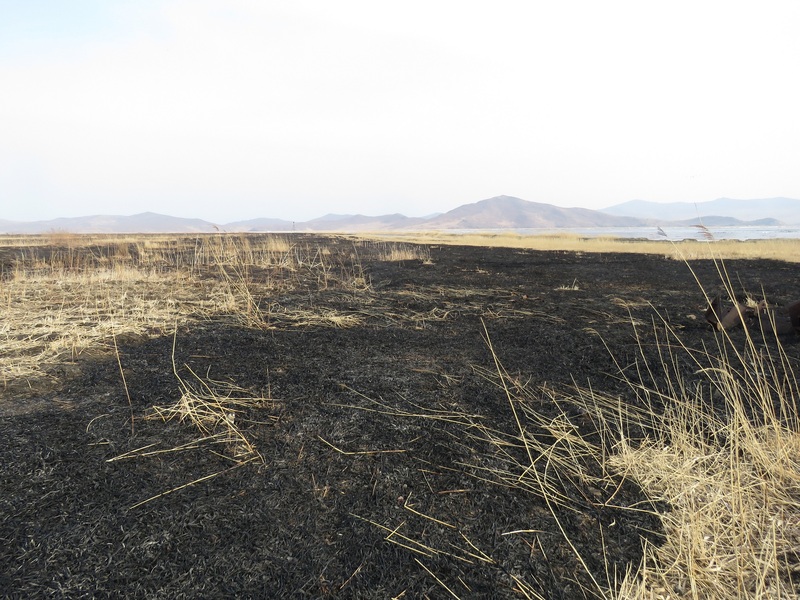 In several places large parts of the reed bed were burnt down recently. This is another problem which might be addressed relatively easy. Also, crabfishing aquaculture directly adjacent and reaching into the main wetland has considerably increased, from four ponds in 2014 to more than 20 now. 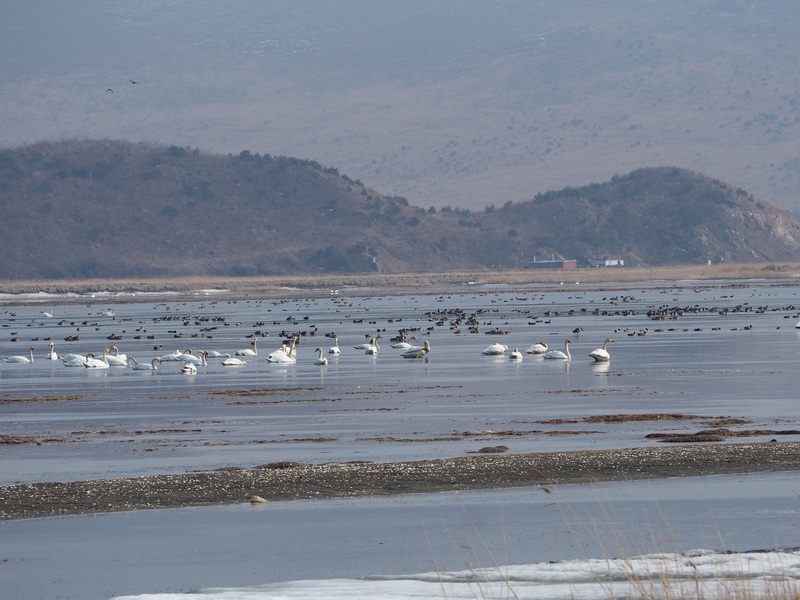 Awareness raising, cooperation with Rason city to improve wetland management, and ways to develop eco-tourism as an alternative source of income for the city remain future challenges, hopefully helped by the much better political climate (despite the cold weather) on the Korean peninsula in 2018. 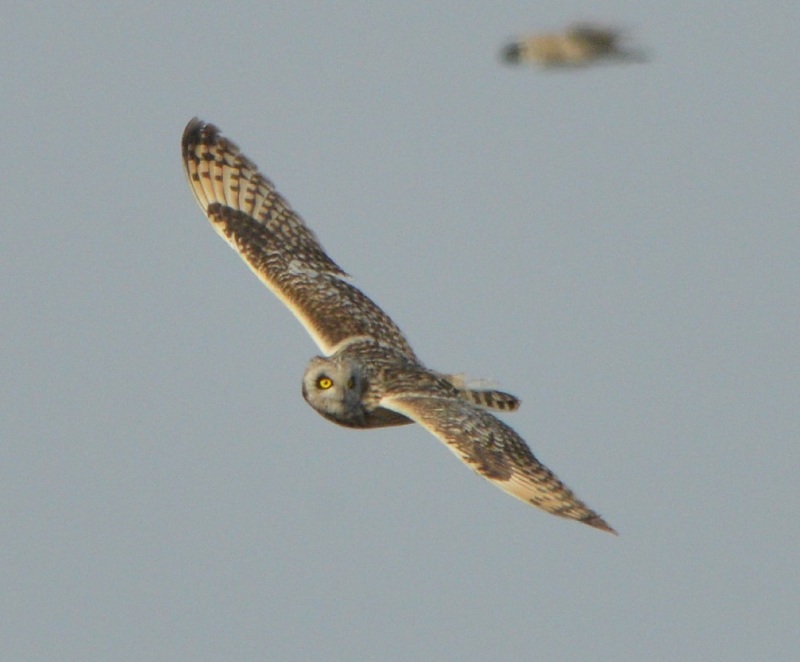 Special thanks go the team of Rason City, to Michael Spavor (Paektu Cultural Exchange) for organizing the Yanji side of the trip and to Dr. Nial Moores (Birds Korea) for helping with IDs from our images.